Yeasts of the genus Candida are commensal and opportunistic pathogens present in practically all human beings, where they commonly cause superficial or deep mycoses. Candida albicans (C. albicans) is the major etiological agent of candidiasis, one of the main types of fungal infections in human. Moreover, other species of the genus Candida, including Candida krusei, Candida tropicalis (C. tropicalis) and Candida parapsilosis, also can cause candidiasis. Although candidiasis can affect healthy people, this condition is significantly more common in immunosuppressed individuals, including patients with diabetes mellitus, lymphoma and acquired immunodeficiency syndrome. In these patients, the main clinical manifestations that are associated with the diagnosis of candidiasis are: systemic-visceral, allergic and mucocutaneous candidiasis. The current treatment of fungal infections is mainly made with azole antifungal drugs, such as: ketoconazole, fluconazole and miconazole. Drugs such as amphotericin B, hydroxypyridinone and nystatin are also important in the management of candidiasis. Despite the effectiveness of these drugs in the treatment of most patients, in recent years, the number of fungal strains resistant to these drugs has increased, demonstrating the need to develop innovative antifungal therapies. In the context of drug development, medicinal plants have emerged as important sources of new bioactive compounds. Accordingly, several studies have demonstrated that plant extracts, essential oils and isolated compounds are effective against the most diverse types of microorganisms, and as such, have the potential to be used in antifungal drug development,. The genus Hyptis, comprises more than 300 plant species that are frequently used in the treatment of skin and gastrointestinal infections and muscular pain. Hyptis martiusii (H. martiusii) Benth is found in the “Chapada do Araripe” region, located in the Ceara state, Northeastern Brazil. This plant is popularly known as “capim limão” and is widely used by the local community due to its medicinal properties. In this context, the pharmacological effects of essential oils obtained from several Hyptis species were previously described, including: antimicrobial, antifungal and insecticidal,. The present work aimed to evaluate, in vitro, the antifungal effect of H. martiusii decoction (DHm) and its major compound, caffeic acid either alone or in combination with fluconazole against different strains of the genus Candida as well as to evaluate the cytotoxicity of these products in human erythrocytes. H. martiusii leaves were collected in “Sítio Barreiro Grande” (07°21′44,0″S e 39°28′41,0″W) located in Crato, Ceará state, Northeastern Brazil and the voucher specimen was deposited in the Herbarium Caririense Dárdano de Andrade Lima, of the Regional University of Cariri (URCA), under the number 4610. The decoction was obtained as described by Avancini and Wiest, with adaptations. Briefly, 390 g of the plant leaves were placed in a hermetically sealed Erlenmeyer containing 1 L of sterile distilled water. The decoction was performed using low heat (with a Bunsen burner and asbestos blanket) for approximately 20 min from the onset of boiling. After cooling at a room temperature, the decoction was filtered, transferred to a sterile recipient and then, frozen in a conventional freezer at -18 °C for 24 h. The decoction was subsequently dried by lyophilization, at a vacuum pressure of approximately 130 μHg, with a condenser temperature of -50 °C, yielding 7.264 g of lyophilized decoction (1.86%). Analytical grade chemicals were used in this work. Methanol, phosphoric acid, gallic acid, chlorogenic acid, caffeic acid and ellagic acid were purchased from Merck (Darmstadt, Germany). Catechin, rutin and quercetin were acquired from Sigma Chemical Co. (St. Louis, MO, USA). High performance liquid chromatography (HPLC-DAD) was performed with a Shimadzu Prominence Auto Sampler (SIL-20A) HPLC system (Shimadzu, Kyoto, Japan), equipped with Shimadzu LC-20AT reciprocating pumps connected to a DGU 20A5 degasser with a CBM 20A integrator, SPD-M20A diode array detector and LC solution 1.22 SP1 software. The H. martiusii extract was injected in a reversed phase Phenomenex C18 column (4.6 mm × 250 mm) packed with 5 μm diameter particles, according to the method described by Waczuk et al with some adaptations. The limit of detection (LOD) and limit of quantification (LOQ) were calculated. Starting solutions were prepared by weighing 10 mg of decoction and caffeic acid [Sigma-Aldrich, ≥98% (HPLC)] and diluiting in 1 mL of dimethyl sulfoxide (DMSO, Merck, Darmstadt, Germany). Subsequently, dilutions were made in sterile distilled water to achieve a concentration of 16.384 μg/mL (solution test). The Candida strains were obtained from the Mycology Laboratory of the Federal University of Paraíba and from the Laboratory of Microbiology and Molecular Biology of the Regional University of Cariri. C. albicans (CA 40006) and C. tropicalis (CT 40042) strains were used in the tests and fluconazole was used as a standard antifungal drug in the modulation assays. The yeasts were kept to grow in Sabouraud Dextrose Agar solid medium and then, transferred to test tubes containing 5 mL of sterile saline. Procedure yielded a standard yeast suspension containing 1 × 105 cells/mL. This test was performed in 96-well plates using the broth microdilution method. Briefly, microdilution plates were added with 1.5 mL of a solution containing 1 350 to 150 μL of the Sabouradu Dextrose Broth (SDB) fungal suspension; serial dilutions using the decoction or caffeic acid were performed to achieve concentrations varying from 8 192 to 4 μg/mL and the last well was used as microorganism growth control. The plates were incubated for 24 h at 35 ° C, and the readings were performed in a spectrophotometer (Thermoplate) at 630 nm. The MIC was defined as the lowest concentration at which no growth was observed. All analyses were performed in triplicate. The minimum fungicide concentration was performed by using each inoculum of the previous test that did not present growth as well as positive controls. A sample of each well that had the MIC determined was cultivated in Sabouraud Dextrose Agar plates. Twenty-four hours after incubation at (35 ± 2) °C, the plates were read to determine the growth of the colonies and the MFC was defined as the lowest concentration that impaired the growth of the subcultures. In this test, we used the method proposed by Coutinho et al. Briefly, solutions of the decoction and caffeic acid were tested at subinhibitory concentrations (MIC/16). Micro tubes were prepared by adding 1.5 mL of the culture medium containing SDB, 150 μL of the fungal suspension and the treatments at concentrations of MIC/16. As control, tubes with 1.5 mL of a solution containing 1 350 μL and 150 μL SDB suspension of the microorganisms were used. One hundred μL of each solution was transfered to a 96-well plate and 100 μL of the antifungal drug was added to the first well and serial dilutions were performed to achieve decreasing concentrations ranging from 8 192 to 4 μg/mL. As previous assays about the cytotoxic effects of the fluconazole have been reported, only the cytotoxic effects of the caffeic acid and the decoction were investigated by the assay using erythrocytes. Blood samples were obtained by collecting 100 mL of blood through venipuncture using a heparinized large caliber syringe. The blood samples were exposed to DHm and caffeic acid at different concentrations (5, 10, 25, 50, 100 and 200 μg/mL), or vehicle (0.9% NaCl + DMSO) for 60 min at room temperature. The blood was then centrifuged to obtain erythrocyte aliquots and calculate dose-response curves. To evaluate the osmotic fragility, blood samples were treated with DHm, caffeic acid or vehicle for 60 and 120 min, under room temperature. Each sample was centrifuged and the erythrocyte aliquots were added in different concentrations of NaCl (ranging from 0.12% to 0.9%). The control group was treated with an isotonic solution (0.9% NaCl). These samples were once again centrifuged, the supernatants were isolated and the optical density for each concentration of NaCl was determined by comparing the external diameters of the cells in each concentration of NaCl with the external diameter of the NaCl solution at 0.12% (100% of lysis). The concentrations of NaCl were determined in three intervals of 60 min each: Interval I : between 0.12% and 0.36%; Interval III : between 0.36% and 0.60% and Interval III : between 0.60% and 0.90%, for the analysis of the percentage of haemolysis in each concentration,,. All experiments were performed in triplicate and expressed as geometric mean using the Graphpad Prism 5.0 software. The results were compared using analysis of variance (ANOVA) and the comparison between the geometric means was performed using the Bonferroni's post-test. The differences with P < 0.05 were considered significant. The HPLC analysis identified the presence of 7 constituents in DHm, including the phenolic compound caffeic acid as a major constituent (1.53%, 24.11 min). In addition to caffeic acid, other compounds were identified, including: quercetin (0.78%, 44.56 min), rutin (0.62%, 37.95 min), catechin (0.61%, 15.02 min), ellagic acid (0.29%, 32.84 min), gallic acid (0.28%, 10.23 min) and chlorogenic acid (0.10%, 21.07 min) [Figure 1] and [Table 1]. 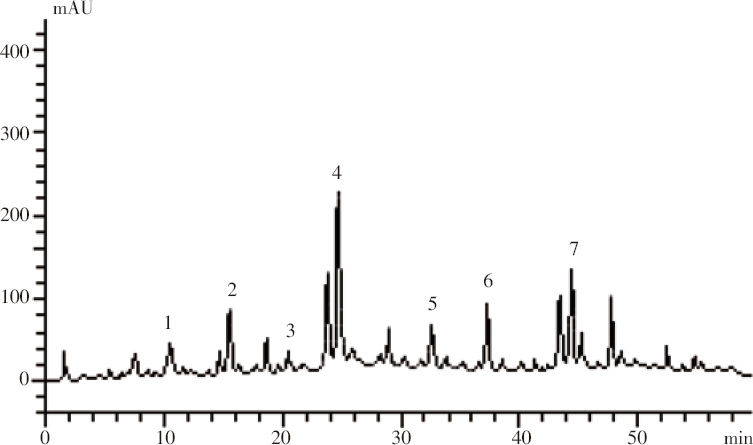 Figure 1: Representative reverse-phase HPLC analysis of H. martiusii sample. Using standard and spectral analysis, compounds were identified as gallic acid (peak 1), catechin (peak 2), chlorogenic acid (peak 3), caffeic acid (peak 4), ellagic acid (peak 5), rutin (peak 6) and quercetin (peak 7). 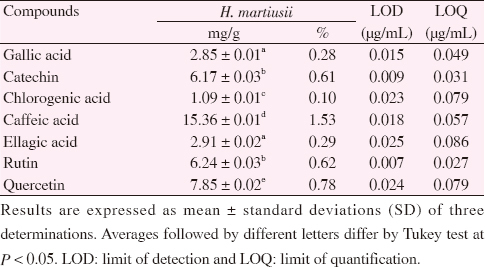 Table 1: Chemical composition of decoction of H. martiusii. The MICs of DHm and caffeic acid against both C. albicans and C. tropicalis were ≥ 4096 μg/mL [Figure 2], which demonstrated a weak antifungal activity. Accordingly, these treatments also presented MFC ≥ 4096 μg/mL. However, when the IC50 values of both DHm and caffeic acid were analyzed against C. albicans, the results obtained were 4.70 and 37.24 μg/mL, respectively, which were significantly lower than the IC50 value of fluconazole (134.4 μg/mL) [Table 2]. Moreover, both DHm and caffeic acid in combination with fluconalzole increased the antifungal action against C. albicans and C. tropicalis, indicating that these treatments can modulate the activity of antifungal agents, improving their effectiveness through a synergistic action [Figure 3] and [Table 2]. Figure 2: MIC of decoction of H. martiusii, caffeic acid and fluconazole against C. tropicalis (2A) and C. albicans (2B) strains. DHm: decoction of H. martiusii; Caf. acid. : caffeic acid; Fluc. : fluconazole. Figure 3: Modulatory effect of decoction of H. martiusii and caffeic acid in combination with antifungal agent fluconazole on multiresistant strains of C. tropicalis (3A) and C. albicans (3B), respectively. DHm: decoction of H. martiusii; Caf. acid. : caffeic acid; Fluc. : fluconazole. indicates statistical significance (P<0.05). Table 2: Antifungal and modulatory activity (IC50) of H. martiusii decoction, caffeic acid and fluconazole in different Candida yeasts. The cytotoxicity of DHm and caffeic acid was investigated by evaluating the osmotic fragility of erythrocytes. In [Figure 4] and [Figure 5], the results demonstrated that the treatment of DHm or caffeic acid did not affect the the cell viability, compared to the treatment with 0.9 % NaCl. On the other hand, the exposure of red blood cells (RBC) to 0.12% NaCl caused 100% of hemolysis. These data indicate that both the DHm and its major compound did not cause significant cytotoxicity in RBC. Figure 4: Osmotic fragility of blood samples treated with different concentrations of decoction of H. martiusii at different concentrations of sodium chloride (NaCl) solution for 1 h (4A) and 2 h (4B). The hemolysis percentage was calculated and “fragility curves” were drawn plotting the percentage of hemolysis (% hemolysis) for each NaCl concentration (relative to 100% hemolysis tube - 0.12% NaCl). Figure 5: Osmotic fragility of blood samples treated with different concentrations of caffeic acid at different concentrations of NaCl solution for 1 h (5A) and 2 h (5B). The phytochemical characterization of the DHm performed in this work corroborates the results of other studies investigating the composition of essential oils obtained from H. martiusii and other species of the same genus, which revealed the presence of phenolic compounds as constituents, including 1,8 cineole, and bicyclogermacrene. On the other hand, the differences in the concentrations of the compounds in essential oils and decoctions obtained from species in the same genus are justified by various environmental factors, including temperature, nutrition and solar radiation index, which influence the phenolic content of a given plant species. In fact, phenolic compounds present great therapeutic potential as antimicrobial, anti-inflammatory and antifungal agents. In another study, the H. martiusii essential oil presented a MIC of 64 μg/mL against the CA 40006 strain. According to Zapata et al and Moreira et al,, the presence of the terpene 1,8 cineole in most essential oils obtained from plants of this genus might be, at least in part, responsible for their antifungal potential. Lima et al in its study found that the caffeic acid among several isolated substances showed synergic effect, potentiating the action of the antifungal fluconazole against C. tropicalis. Oliveira et al evaluated the antifungal activities of the essential oil of Ocimum gratissimum against the fungi of the Candida genus. Santana et al evaluated activities of different extracts of Kalanchoe pinnata leaves against both fungi and bacteria. Additionally, the essential oils of other species of the genus Hyptis presented antifungal activity with clinical relevance against other fungal strains,. The antifungal activities of the essential oils obtained from Cymbopogon martinii, Ocimum basilicum and Thymus vulgaris were evaluated against C. albicans strains and the results revealed that these treatments presented MIC ≥ 2000 μg/mL, indicating low to moderate antifungal activity,. In fact, It has been demonstrated that natural products present different inhibitory profiles against C. albicans which can be attributed to numerous factors, including the chemical composition of different species or genus, climatic conditions and water availability in the soil, which affect the secondary metabolism of the plants. In order to minimize the side effects of commercial antifungal drugs, several researchers have studied the effect of the combination of these drugs with natural products, which can present synergistic actions, thus reducing the MIC of both commercial antifungal agents and natural compound. This combination can have significant clinical relevance due to the decrease of the therapeutic dose, resulting in reduced side effects. In this study, both DHm and caffeic acid in combination with fluconalzole increased antifungal actions against C. albicans and C. tropicalis, showing synergistic effect. Accordingly, the modulatory activities of natural products in association with fluconazole were previously reported by several studies. Endo et al demonstrated the synergic effect obtained by the combination between fluconazole and extracts or isolated compounds from Punica granatum against C. albicans. Several mechanisms might be associated with this synergic effect promoted by natural products, including: alteration of the membrane permeability, facilitating the penetration of antifungal drugs; interference with biological processes that are vital for the microorganism, such as the synthesis of ergosterol (an essential component of the fungal membrane); interference with the growth mechanism of microorganisms and alterations in the respiratory chain. Thus, the current search for new compounds with antifungal activity is focused on discovering compounds that present antifungal properties both alone or in association with commercial drugs through a synergic action. This strategy is known as “herbal shotgun” or “synergistic multieffect targeting”,. This fragility is defined by the contact of RBC with increasing concentrations of NaCl. The hemolysis is evaluated by reading the free hemoglobin content in a spectrophotometer (540 nm). The presence of hemolysis generated by the exposure of RBCs to tested substances can be related directly with their cytotoxicity and can be used in in vitro toxicological screenings. According to the cytotoxic activity, we can observe osmolarity-related cellular lysis is associated with both extrinsic and intrinsic factors, such as: cell morphology and size, type of species and intrinsic characteristics of the membrane. Therefore, alterations in the membrane of erythrocytes serve as a parameter of evaluation of its stability or composition and thus, might be useful in the diagnosis of several diseases and in the evaluation of cellular effects of drugs,. The chemical profile of the decoction obtained from H. martiusii is characterized by the presence of phenolic compounds, including caffeic acid as major compound. DHm and caffeic acid singly did not present clinically significant antifungal activity. However, in combination with fluconazole, they presented significant synergistic effects against C. albicans and C. tropicalis strains. Moreover, the decoction and the caffeic acid did not cause significant hemolytic effects, indicating the low cytotoxicity of these products. According to the results obtained, it is indicated that DHm modulates the activity of antifungal drugs with a low toxicity. This fact has a great importance, considering that the use of antifungal agents derived from plants can represent an interesting strategy for the treatment of different kinds of fungal infections, maily in immunodepressed patients, since infections caused by fungi are increasingly prevalent and difficult to treat. Due the fact that this plant is very useful as food and remedy for treating several illnesses by populations from the northeastern region of Brazil, this work demonstrates the phytomedical potential of the products obtained from this plant. However, further studies are necessary to identify different uses and new pharmaceutical formulations to be used by the population. The authors wish to thank the brazilian research support institutions: CNPq, CAPES and FUNCAP. Oliveira WA, Lima RB, Arrua JMM, Lima EO, Wanderley PA. Effects of the essential oil of Cymbopogon winterianus against Candida albicans. Rev Pan-Amaz Saúde 2015; 6(5): 21-26. Barnes RA. Early diagnosis of fungal infection in immunocompromised patients. J Antimicrob Chemother 2008; 61(1): 3-6. Van Burik JAH, Magee PT. Aspects of fungal pathogenesis in humans. Ann Rev Microbiol 2001; 55(1):743-772. Patterson TF. Advances and challenges in management of invasive mycoses. Lancet 2005; 366(9490): 1013-1025. Duarte MCT, Figueira GM, Sartoratto A, Rehder VLG, Delarmelina C. Anti-Candida activity of Brazilian medicinal plants. J Ethnopharmacol 2005; 97(2): 305-311. Phongpaichit S, Subhadhirasakul S, Wattanapiromsakul C. Antifungal activities of extracts from Thai medicinal plants against opportunistic fungal pathogens associated with AIDS patients. Mycoses 2005; 48(5): 333-338. Harley RM. Revision of generic limits in Hyptis Jacq (Labiatae) and its allies. Bot J Linnean Soc 1988; 98: 87-95. Coutinho HDM, Costa JGM, Lima EO, Siqueira-Júnior JP. Additive effects of Hyptis martiusii Benth with aminoglycosides against Escherichia coli. Indian J Med Res 2010; 131(1):106-108. Ilboudo ZA, Dabiré LCBB, Nébié RCHC, Dugravot IOD, Cortesero AME, Sanon A. Biological activity and persistence of four essential oil stowards the main pest of stored cowpeas, Callosobruchus maculatus (F.) (Coleoptera:Bruchidae). J Stored Prod Res 2010; 46(1): 124-128. Avancini CAM, Wiest JM. Atividade desinfetante do decocto de Hypericum caprifoliatum Cham. e Shclecht. - Guttiferae (“escadinha/sinapismo”), frente a diferentes doses de Staphylococcus aureus (agente infeccioso em mastite bovina). Rev Bras Plantas Med 2008; 10(1): 1-10. Waczuk EP, Kamdem JP, Abolaji AO, Meinerz DF, Bueno DC, Gonzaga TKSN, et al. Euphorbia tirucalli aqueous extract induces cytotoxicity, genotoxicity and changes in antioxidant gene expression in human leukocytes. Toxicol Res 2005; 4(1): 739-748. Boligon AA, Kubic TF, Mario DN. Antimicrobial and antiviral activity-guided fractionation from Scutia buxifolia Reissek extracts. Acta Physiol Plant 2003; 35(1): 2229-2239. CLSI. Methods for determining bactericidal activity of antimicrobial agents: Approved guideline. Wayne, PA: Clinical and Laboratory Standards Institute; 1999. Ernst EJ, Klepser ME, Ernst ME, Messer AS, Pfaller MA. In vitro pharmacodynamic properties of MK-0991 determined by time-kill methods. Diagnostic Microbiol Infect Dis 1999; 33(2): 75-80. Coutinho HDM, Costa JGM, Falcão-Silva VS, Siqueira-Júnior JP, Lima EO. Effect of Momordica charantia L. in the resistance to aminoglycosides in methicilin-resistant Staphylococcus aureus. Comp Immunol Microbiol Infect Dis 2010; 33(6): 467-471. Barros FJ, Costa RJO, Cesário FRAS, Rodrigues LB, Costa JGM, Coutinho HDM, et al. Activity of essential oils of Piper aduncum anf and Cinnamomum zeylanicum by evaluating osmotic and morphologic fragility of erythrocytes. Eur J Integrat Med 2016; 8(1): 505-512. Caires NA, Gileno MC. Padronização e aplicação da curva de fragilidade osmótica no auxilio diagnóstico de anemias. Rev Uniara 2002; 15(2): 49-58. Schiar VPP, Santos DB, Ludtike DS, Vargas F, Paixão MW, Nogueira CW, et al. Screening of potentially toxic chalcogens in erythrocytes. Toxicol In Vitro 2007; 21(1): 139-145. Barbosa AGR, Oliveira CDM, Lacerda-Neto LJ, Vidal CS, Saraiva RA, Costa JGM, et al. Evaluation of chemical composition and antiedematogenic activity of the essential oil of Hyptis martiusii Benth. Saudi J Biol Sci 2015; 18(2): 1-7. Caldas GFR, Costa IMA, Silva JBR, Nóbrega RF, Rodrigues FFG, Costa JGM, et al. Antiulcerogenic activity of the essential oil of Hyptis martiusii Benth. (Lamiaceae). J Ethnopharmacol 2011; 137(1): 886-892. Sousa EO, Colares AV, Rodrigues FFG, Campos AR, Lima SG, Costa JGM. Effect of collection time on essential oil composition of Lantana camara Linn (Verbenaceae) growing in Brazil Northeastern. Rec Nat Prod 2010; 4(1): 31-37. Han Y. Rutin has therapeutic effect on septic arthritis caused by Candida albicans. Internat Immunopharmacol 2009; 9(2): 207-211. Oliveira WA, Lima RB, Arrua JMM, Lima EO, Wanderley PA. Effects of the essential oil of Cymbopogon winterianus against Candida albicans. Rev Pan-Amazônica de Saúde 2015; 6(3): 21-26. Zapata B, Dura C, Stashenko E, Galvis LB, Arango ACM. Actividad antimicótica, citotoxicidad y composición de aceites esenciales de plantas de la familia Labiatae. Rev Universidad Ind Santander Salud 2009; 41(3): 223-230. Moreira ACP, Lima EO, Wanderley PA, Carmo ES, Souza EL. Chemical composition and antifungal activity of Hyptis suaveolens Poit leaves essential oil against Aspergillus species. Braz J Microbiol 2009; 41(1): 28-33. Lima VN, Oliveira-Tintino CDM, Santos ES, Morais LP, Tintino SR, Freitas TS, et al. Antimicrobial and enhancement of the antibiotic activity by phenolic compounds: Gallic acid, caffeic acid and pyrogallol. Microbial Pathogenesis 2016; 99(1): 56-61. Oliveira LBS, Batista AHM, Fernandes FC, Sales GWP, Nogueira NAP. Atividade antifúngica e possível mecanismo de ação do óleo essencial de folhas de Ocimum gratissimum (Linn.) sobre espécies de Candida. Rev Bras Pl Med Campinas 2016; 18(2): 511-523. Santana PS, Andreza RS, Leite VI, Sousa PVC, Alves AA, Tintino SR, et al. Efeito antibacteriano e antifúngico de extratos etanólico, hexânico e metanólico a partir de folhas de Kalanchoe pinnata (Lam.) Pers (Malva corama) contra cepas multi-resistentes a drogas. Biota Amazónia 2016; 6(1): 64-69. Sartoratto A, Machado ALM, Delarmelina C, Figueira GM, Duarte MCT, Rehder VJG. Composition and antimicrobial activity of essential oils from aromatic plants used in Brazil. Braz J Microbiol 2004; 35(4): 275-280. Duarte MCT, Figueira GM, Sartoratto A, Rehder VLG, Delarmelina DC. Anti-Candida activity of essential oils and extracts from native and exotic medicinal plants used in Brazil. J Etnopharmacol 2005; 97(2): 305-311. Freire CM, Marque MMO, Costa M. Effects of seasonal variation on the central nervous system activity of Ocimum gratissimum L. essential oil. J Ethnopharmacol 2006; 105(1-2): 161-166. Figueredo FG, Ferreira EO, Lucena BF, Torres CM, Lucetti DL, Lucetti EC, et al. Modulation of the antibiotic activity by extracts from Amburana cearenses A. C. Smith and Anadenanthera macrocarpa (Benth.) Brenan. Biomed Res Int 2013; 2013(1): 1-5. Endo EH, Garcia-Cortez DA, Ueda-Nakamura T, Nakamura CV, Dias-Filho BP. Potent antifungal activity of extracts and pure compound isolated from pomegranate peels and synergism with fluconazole against Candida albicans. Res Microbiol 2010; 161(7): 534-540. Ahmad A, Khan A, Akhtar F, Yousuf S, Xess I, Khan LA, et al. Fungicidal activity of thymol and carvacrol by disrupting ergosterol biosynthesis and membrane integrity against Candida. Eur J Clin Microbiol Infect Dis 2011; 30(1): 41-50. Burt S. Essential oils: Their antibacterial properties and potential applications in foods-a review. Internat J Food Microbiol 2004; 94(3): 223-253. Coutinho HDM, Vasconcellos A, Lima MA, Almeida-Filho GG, Alves RRN. Termite usage associated with antibiotic therapy: Enhancement of aminoglycoside antibiotic activity by natural products of Nasutitermes corniger (Motschulsky 1855). BMC Complement Altern Med 2009; 9: 35. Wagner H, Ulrich-Merzenich G. Synergy research: Approaching a new generation of phytopharmaceuticals. Phytomedicine 2009; 16(2-3): 97-110. Rodrigues HG, Batista MTA, Fonseca LC, Aversi-Ferreira TA. Efeitos de pesticidas sobre a fragilidade osmótica de eritrócitos - Uma breve revisão. Biotemas 2011; 22(1): 7-16. Srinivasan K, Kempaiah RK. Beneficial influence of dietary curcumin, capsaicin and garlic on erythrocyte integrity in high-fat fed rats. J Nutrit Biochem 2006; 17(7): 471-478.